Three DLSPH internationally recognized faculty with expertise in clinical public health, global health policy and health policy innovation were awarded two new Dalla Lana endowed chairs and one early career professorship, all supported by the Dalla Lana family. 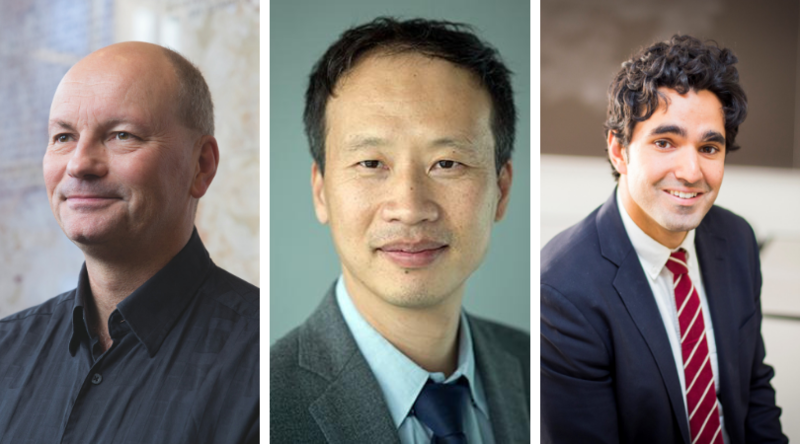 Professor Ross Upshur was awarded the Dalla Lana Chair in Clinical Public Health, Associate Professor Xiaolin Wei was awarded the Dalla Lana Chair in Global Health Policy, and Assistant Professor Andrew Boozary was awarded the Early Career Professorship in Health Policy Innovation. The Dalla Lana Chairs are part of the cumulative effect of the Dalla Lana family’s transformative $40-million gift to inaugurate the School and enhance its impact in critical disciplinary areas. Spurring innovation in health policy is a key priority for these roles, as well as the translation of knowledge into training, policy and community impact. “As chair, I will endeavour to create interdisciplinary research programs that tackle complex health issues, with a particular focus on health inequity,” said Upshur, Clinical Public Health Division Head and Scientific Director at Bridgepoint Active Health Care and Sinai Health System. An enthusiastic and decorated scholar, administrator and physician, Upshur held the Canada Research Chair in Primary Care Research from 2005-2015 and was named one of the Top 20 Pioneers in Family Medicine Research, a distinction he received based on his research at the interface of primary care and public health. As Dalla Lana Chair in Clinical Public Health, Upshur will work closely with leadership across Toronto’s academic health ecosystem and internationally to design research and education programs that address the increasing complexity of patient and population needs in primary care. Like Upshur, Wei is also experienced in primary care, but with a stronger focus on innovative capacity development in low-and-middle-income countries. “With this chair, I’ll build a state-of-the-art implementation research program to address high-profile global and local health challenges,” said Wei, Associate Professor of Health Systems and Clinical Public Health at DLSPH and IHPME. He’s created an impressive global footprint by combining policy, practice and scholarship to tackle antimicrobial resistance, hypertension and diabetes management, tuberculosis care, and primary care policy development. He has partnerships with health authorities in China, Cambodia, Indonesia, Pakistan, Nepal, Bangladesh, the Philippines, Ghana, Kenya, and Swaziland, as well as in Canada and the UK. Wei is also the Vice President of the International Union Against Tuberculosis and Lung Disease. Wei’s Dalla Lana Chair in Global Health Policy will grow his already expansive global network and support his translational impact on population health and equity in communities worldwide. Similarly, Boozary also leverages evidence to influence public policy. With his Early Career Professorship in Health Policy Innovation, he will continue to work with provincial decision-makers to design and implement new health care delivery models. “This professorship affirms my commitment to promoting sustainable innovation within our publicly funded health care system,” said Boozary, Executive Director of Health and Social Policy at the University Health Network. Working at the interface of science, policy-making and public engagement, Boozary has experience advancing health equity agendas in both Canada and the United States. He has advised federal and provincial leaders in a variety of Canadian health system reforms, including pharmacare, primary care delivery, provider payment models and public reporting. He also leads active research on Accountable Care Organizations and their impact on access and affordability in the United States. “A major takeaway from my cross-comparative experience is how seemingly progressive policies can end up with unintended consequences for disadvantaged populations,” he said. “This sharpened my interest in how to combine scientific evidence with behavioural insights in the policy process to ensure better outcomes for those who need it most,” said Boozary, who has already worked with many DLSPH faculty, including Dean Steini Brown and Professor Ahmed Bayoumi who supported his Open Pharma campaign in which he advocated for a more transparent health care system. Together, these researchers are engaging local health system partners, government and international collaborators to tackle health inequity and system sustainability, creating stronger health systems and healthier populations.